Using the Burger King app is about to pay off big time. 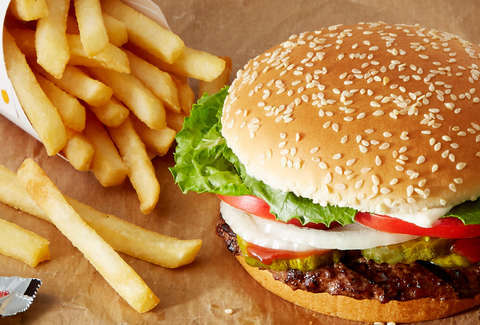 The fast food chain is launching a new 2018 holiday-inspired promotion called the 12 Days of Cheesemas that includes thousands of prizes, like coupons for one-cent Whoppers, a car, a luxury vacation, and cold hard cash. Your family, friends and loved ones may skimp on the gifts this year, but the royal burger purveyor is not. App users who play the in-app game during the 12 Days of Cheesemas will be automatically entered to win one of thousands of prizes. All you have to do after playing is tap the gift to see if you’ve won, according to the official rules. Returning users can gain an additional game play by placing their order through the app while the promotion lasts. Prizes up for grabs include one-cent food coupons, a 2019 Jeep Latitude, a trip for two to Bermuda, cash prizes, a $500 airline credit, free BK for a year, a PlayStation 4, an iPad Pro, Burger King Swag, and, if you can imagine it, even more. The more you play, the more chances you’ll have to win. Of course, playing on a regular basis will require eating a lot of Burger King. Each order also grants you a single entry to win Burger King’s $30,000 grand prize. Imagine how many Whoppers you could buy with all that money in the bank. The grand prize drawing will take place on or around December 31. The lucky winner will be notified via email or phone within three days of the initial drawing. If you win, maybe you can use some of that prize money on a fancy gym membership to work off your 12-day burger diet. Want more free food and drink? Check out our running list of all the food giveaways and discounts throughout the month. Caitlyn Hitt is Daria IRL. Don't take our word for it -- find her on Twitter @nyltiaccc.